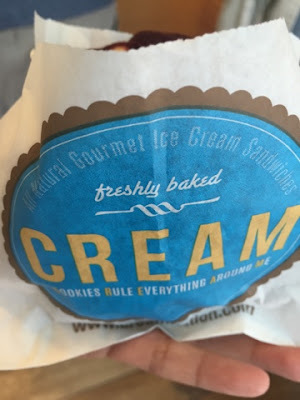 CREAM, a cookie ice cream sandwich place, opened in the College Area, near the San Diego State University campus earlier this year, but I only recently had the chance to visit and try it. It is located right across from the large bridge that leads to the Conrad Prebys Aztec Student Union and it is snuggled in between Bruxie and Bangkok Poco, a Thai restaurant. Unfortunately, I was only able to take two photos of my experience here (booo, I know). They have a wide range of ice cream flavors here, including my favorite, strawberry cheesecake! 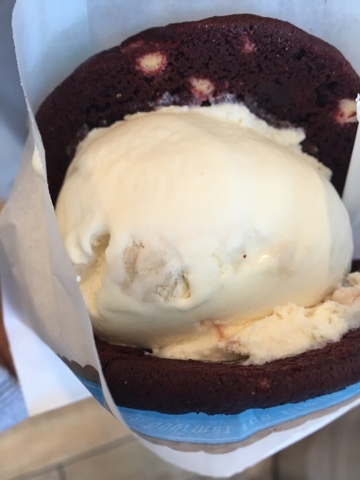 You can order cookie ice cream sandwiches or you can order scoops in a cup and get the cookies on the side. They have a lot of toppings, as well, from sprinkles, mini candies, and sauces. 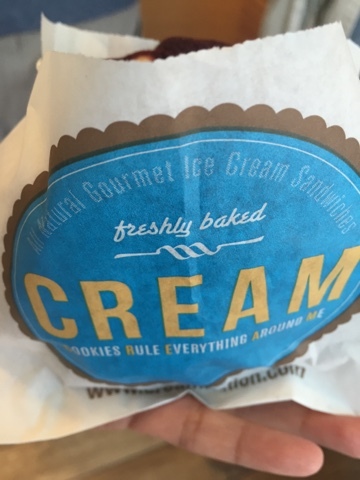 I ordered a scoop of their delicious strawberry cheesecake ice cream in between two red velvet (with white chocolate chips) cookies ($2.99). The ice cream was my favorite part. It was creamy, sweet and velvety. The cookies were okay. They tasted like they were baked earlier, so it did not have that fresh, soft baked taste I was looking for. Next time, I would probably order a scoop of ice cream and a cookie on the side. I will still give their cookies a chance. The place is small and has outdoor seating. Because they share a lot with two other restaurants, parking is limited, but you can always find parking on the street near Buddie's Burgers or even pay for one hour parking in the SDSU parking structure near by. While you are near the SDSU campus, you might as well take a tour, too! I will definitely be back when I have a craving for their strawberry cheesecake ice cream. Yum!